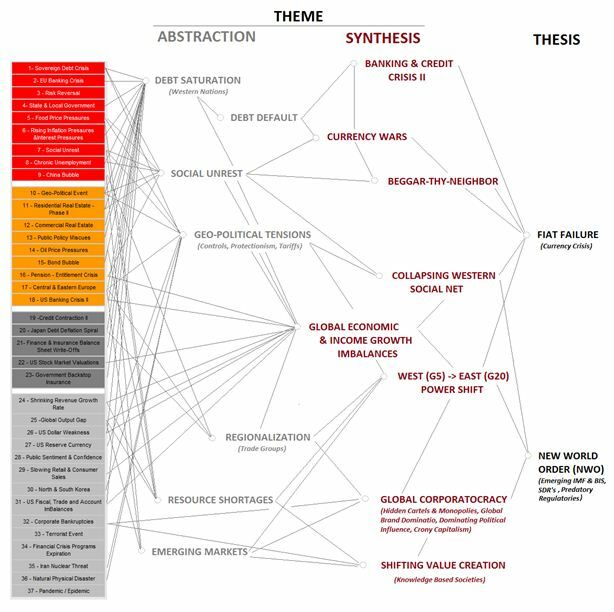 The conclusions of our "2011 Thesis - Beggar-thy-Neighbor" was that the world is on a glide path towards a global Fiat Currency Failure and the emergence of a New World Order. We are unclear whether it is planned or happenstance, but what the regularly conducted abstraction mapping process clearly indicates is that it is presently a high probability outcome. The paper (which will be made available to non subscribers March 11th, 2011- lcmgroupe[at]comcast[dot]net (Subject: 2011%20THESIS) (sign-up)) uses the Process of Abstraction to avoid the media noise, abstract the facts, synthesis key macro drivers and then arrive at the highest probability outcomes. In the recent article "2011 Tipping Points" we laid out the 37 major Tipping Points we are presently tracking. These Tipping Points are show on the left hand side of the two charts below, which are the basis upon which our ongoing analysis process is conducted. These highly simplified representations of the process gives the reader a graphical perspective on what leads us to our conclusions.